This photo was taken in Vancouver’s Stanley Park on October 10th 2015, when J and I took a walk along the Lost Lagoon trail. The day was overcast but, luckily, it didn’t start raining until we got back to our car. We were visiting my sister and her husband in Vancouver for Thanksgiving. Also, J and I got married that weekend! Scientists recognize 24 subspecies of Song Sparrows and have described some 52 forms: they are one of the most regionally variable birds in North America. In general, coastal and northern birds are darker and streakier, with southern and desert birds wearing paler plumages. 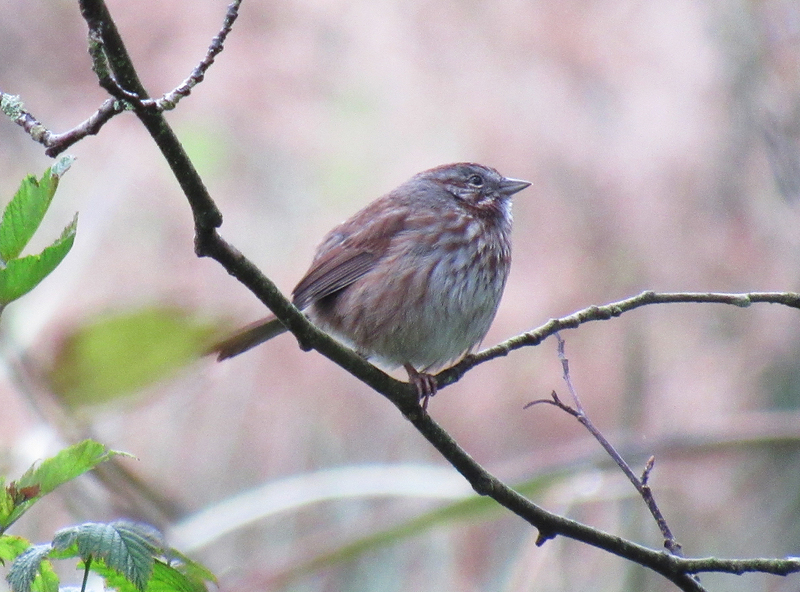 Here is another Pacific Northwest song sparrow from my October walk with J. The photo below is also from Stanley Park near the Lost Lagoon, but I took it on May 12th 2015 with my old Canon Powershot camera, which only has 3x zoom instead of 50x. People had left some seeds on the ground so the birds let me get a little bit closer than they normally would. J and I were fortunate to spend another long weekend in Vancouver in December of 2015. J had some work meetings in Coal Harbour on a Friday morning, and I took advantage of the sunny weather to walk along the recreational path that follows the harbour. I heard some rustling and glimpsed some movement in longish grass and dead leaves. 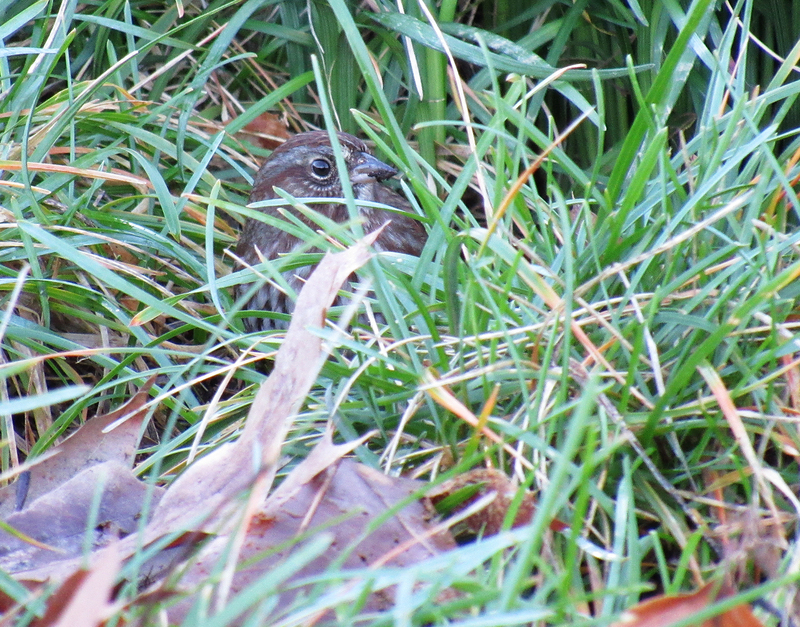 A song sparrow took a peek out while foraging. Beautiful colors on that bird! Lovely hues of burgundy/brown. You take excellent photos! The look on that last bird’s face is priceless! It’s the same look of a kid caught with his hand in the cookie jar. 😀 I love song sparrows and I love your photos of them even more! Totally a ‘caught in the cookie jar’ look :-D! Thanks for the sparrow and sparrow photo love ❤ <3. One of the cool things about sparrow photos is that they can be viewed at larger than life size at very close range :-). They don't move though. Or sing… Or live in fresh smelling places. Sweet little birds, I love their spring calls. They’re beautiful! I love their colors. They’re more red than ours are. May 12th that year was a good birdy day for you! It’s my lucky day. It’s my Birthday! That last image is priceless! So, so cute!! May 12th is a great day for birthdays and bird days! Ahh, the middle of spring! Hope your coming birthday is full of luck and joy :-). I took a few pictures of that last bird. Luckily, the blade of grass was just in the right place on that one, between the beak and the eye! I’m glad I have decent pictures of two subspecies – interesting to compare. Thanks Carol :-)! I’m so glad you liked the photos and had the pleasure of enjoying Stanley Park not too long ago. I walked by the cannon once and it went off a little after I walked by. I didn’t expect it, so it definitely scared me! OMG look at these lovelies. Fabulous shots, Myriam! Wow! Thank you so much, Laura :-)! Congratulations to you on your wedding, Myriam! I am excited for you. It looks like song sparrows want to bless your marriage, too. Thanks, Melissa :-)! Song sparrow blessings…. those sound lucky :-). 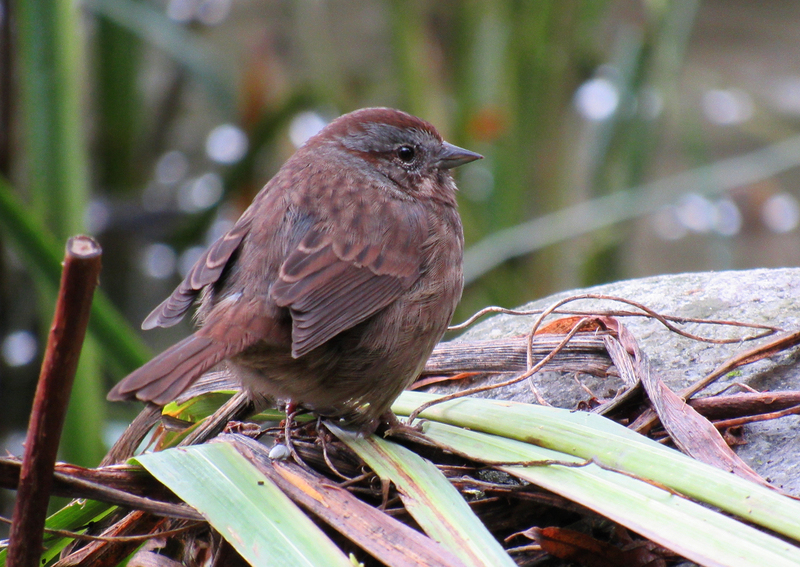 The sparrows are beautiful and oh so cute…especially when puffed out. Great photographs, lovely variety. Thank you for sharing. I’m thrilled you liked the sparrows, Haunani :-). Their brown variations are quite lovely up close. These are really nice photos, Myriam. (All are cuties, but I especially like the peek-a-boo sparrow in the grass.) Good eyes! Thanks, Michael :-)! My bird eyes and ears have gotten much keener in the past year. Myriam, these is a very striking population of the species. Thanks for sharing. If you are particularly interested in Song Sparrow subspecies, check my Facebook group page called simply “Song Sparrows”. It deals mostly with California populations, but folks are submitting birds from all over the ABA. Hi Matthew. I’m glad you enjoyed seeing this subspecies and thanks for sharing it with others who might be interested too. I don’t use Facebook but I do have a “bare bones” page that I occasionally log into to look at others’ pages. So I found your “Song Sparrows” page. Lots of interesting song sparrow sightings! 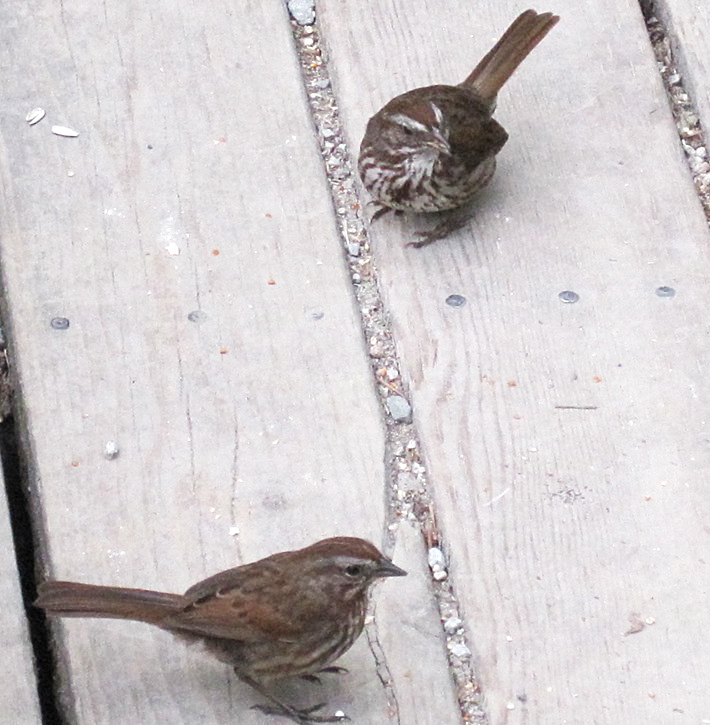 I remembered your song sparrow subspecies drawings from a while back. It is wonderful how you captured the different shades of brown, grey and beige. I like your stamp series. Do you happen to have prints of all the different subspecies on one page (full bodies)? Great photos. Thank you for the info. I thought the variations in the Song sparrow coloring was due to their age, now I know there are subspecies. Love your new avatar. Thanks :-). I’m thrilled you enjoyed the photos and learned something interesting. Not sure if you noticed the comment above yours, but Matthew Dodder drew a beautiful series of coloured pencil drawings of the different Song Sparrow subspecies in California. I thought a bird avatar would be a touch more appropriate for my blog than a mushroom :-D.
Great post – really nice photos. I was disappointed in the drabness of Song Sparrows when I moved out here (Seattle area) from New York. The east coast birds tend to be more distinctly marked. But I can’t help thinking they blend in better here with the darker overall coloring – and it’s all good of course! 😉 And the songs – amazing variety in their songs, not even regionally, but from bird to bird. Next Next post: Happy Mother’s Day and Draw-A-Bird-Day!